Open yourself to possibilities outside of work. Home / Adviart Blog / Open yourself to possibilities outside of work. 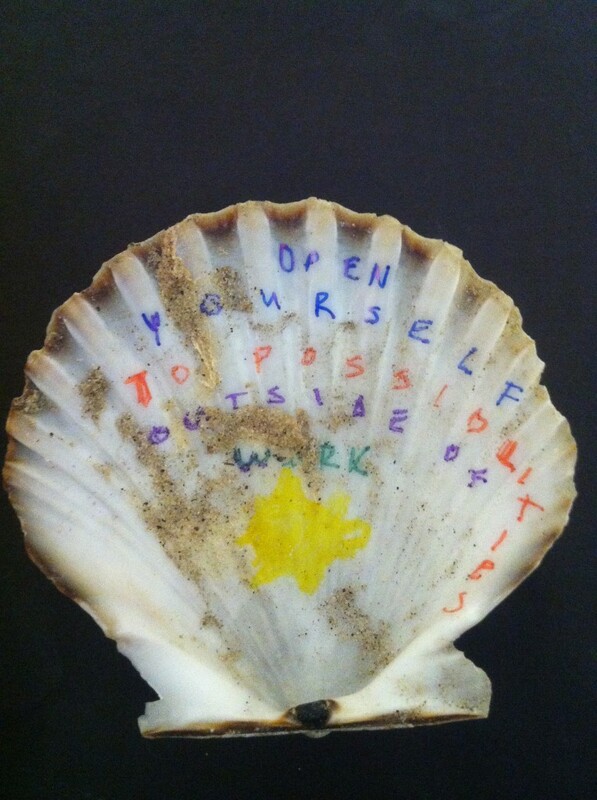 Open yourself to possibilities outside of work. This adviarter picked the shell because it had an open side–which aligned with the advice to be open. The adviarter spoke from experience as she is in a place in her life where she is open to possibilities. The yellow was used to represent sunshine–positivity that abounds in each conversation that we have. The words were written in capital letters on the spine of the shell in a rainbow like fashion–starting with UVA’s colors of orange and blue (the adviarter’s school) and going to purple and green. The rainbow also symbolizes being open. The advice coming from the adviarter’s perspective that young people are focusing so much on their careers and putting off things outside their careers (like relationships, activities, etc…) that they are missing out on life and possibilities. Being open requires confidence, the ability to think through being open and a natural ability to want to be open overall. How do we make sure we are balancing opportunities both inside and outside of work? Where do we build the confidence to be willing to experience, fail, get back up again, and explore life?